Become an armchair conservationist! Learn about the Lowland Tapir Conservation Project in Brazil. Check the wildside of arkanimals.com to find out about grassroots conservation projects and how you can help animals around the world. Patrícia Medici is a 28 years old conservation biologist from Brazil. She works for a Brazilian non-profit NGO called IPÊ - Institute for Ecological Research and coordinates a ground breaking long-term research project on lowland tapirs, Tapirus terrestris. Patricia's work is taking place in one of the last remnants of Atlantic Rainforest. A Forest located in the State of São Paulo, the most developed state of the country. The Brazilian Atlantic forest is one of the most threatened ecosystems of the planet and is at risk of large-scale destruction. It is also one of Conservation International's designated global hotspots. Tragically, these forests have been fragmented and reduced to only about 7 % of their original size. Patricia's long-term study on the aspects of the conservation of lowland tapirs in Pontal do Paranapanema Region, São Paulo, started in October 1996. It takes place in Morro do Diabo State Park (35,000 hectares --sadly one of the last remnants of significant size in this ecosystem.) and in the surrounding forest fragments. and to stimulate and help them to establish agro-forestry plots in their properties. Individual tapirs are trapped and radio-collared and their movements continuously monitored and mapped throughout the landscape. "We have already caught and successfully radio-collared 18 animals and have developed safe methods and protocols to capture and anaesthetize the animals." One of the challenges of this study was to capture the tapirs to be able to install the radio-collars and thus begin data collection. Other researchers had already captured tapirs in the wild, but under different contexts. The first five months of fieldwork on this project demanded careful planning and testing of different strategies. These efforts proved to be very important for the success of the project. 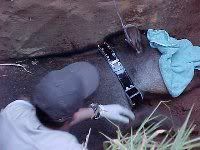 Pitfalls (pits where the animals are trapped) are the preferred capture method. The anesthetic protocol and capture techniques were exhaustingly tested and showed that they were both efficient and safe. The group has also developed an appropriate sampling method to collect the data. Invaluable information on the tapirs' potential as landscape detectives (a term coined by Richard T. T. Forman in 1995) has been gathered, and it is becoming clear that the animals leave the Park more often then previously thought. This information is critical to the development of the regional conservation plan for the landscape of the Pontal Region. "Five of the animals captured all over the project are moving between the Park and neighboring fragments. In order to do so, they have to cross an area where landless people have been settled (195 families) and the field team has been able to collect data about this migration. This has been of critical importance because it is been possible to detect the routes they use to leave the Park." One of the most critical findings of this project is that the Park AND the remaining forest fragments are needed to maintain a genetically and demographically viable population of these ungulates and the other animals inhabiting the region. "Within the park, tapirs are relatively protected, but it is not large enough to contain a viable population of 1,000 animals. 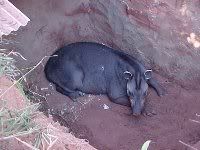 The population within the park relies for long-term viability on connections with, and survival of, tapirs in forest fragments outside the park. We intend to increase their habitat by creating corridors and buffer zones around the natural habitats, connecting the park to the smaller forest fragments. Through the project we have been able to train a considerable number of field assistants and students. Landless people settled around the Park are getting more and more involved in the project, helping with the captures, attending lectures and participating in agro-forestry workshops that IPÊ prepares and conducts for them. Another selling point of the program is economic: we suggest agro-forestry, including tree-species that are compatible with wildlife and can be farmed for good prices. Response has been enthusiastic." 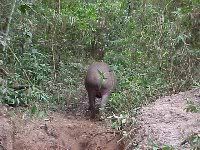 Data collected through this study, has already been crucial to influence the landscape management of the Plateau Forests in the region of the Pontal do Paranapanema and is likely to influence conservation strategies for all tapir species. "It has been extremely difficult to raise the necessary funds to keep this project alive. 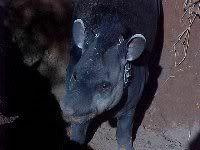 It seems that funding agencies and donors in general do not see tapirs, especially lowland tapirs, as a conservation priority. Much of the information needed to develop effective conservation strategies for the four tapir species is still unknown. Basic facts of biology, behavior, ecology, range and the use of the landscape are uncertain and we still have a lot of work ahead of us. So, I use this opportunity to ask for your help. Please, help me to keep this project alive and to work for the survival of this amazing key tropical species. It is worth it and my promise remains the same --I will do whatever I can to help these wonderful animals! All the best wishes from Brazil. What other animals benefit from this project? The Morro do Diabo State Park is one of the last areas in the world where you can still see the black-lion-tamarins, one of the most endangered species of primates in the world. In addition there are jaguars, ocelots, pumas, two species of deer, two species of peccaries, agoutis, capybaras, several species of small rodents and birds, caiman, howler monkeys, capuchins, and more. We are using the tapirs as landscape detectives so we'll find out what are the routes they use to move through the landscape and we'll use those routes as potential areas to be covered by forests as corridors. Having the park connected with the smaller forest fragments around will increase connectivity and habitat for all those species. What else unique have you discovered that would be of interest to my readers? Many things, but the most important is that we have discovered that tapirs move through the landscape, as jaguars, pumas and ocelots. We also found out that tapirs are not "strictly" solitary as previously thought. We've had the chance to see these animals traveling and foraging in pairs many times, and not only in mother-calf and female-male situations. Tapirs have a territory but it seems that they don't defend their areas. We've found out that there's a high percentage of overlap between neighbors and this will, for sure, result in a higher density of tapirs in the park, compared to previous surveys. We've also found out that jaguars and pumas can and do eat adult tapirs (we've found many fresh kills in the park) and not only young and old ones! I've also discovered that sometimes the potential enemies of conservation, such as the landless people settled around the park, can turn into conservation supporters if you find the right way to deal with them! AND...we've also discovered that it's hard to capture tapirs!!!! In the beginning of the project we spent 120 nights up in a platform waiting for the tapirs to come to our bait stations and they didn't come! Those animals have pretty good sense of smell and could smell us from a good distance!!!!! Thank you again for your attention and help.